Cartoony yet stylish...I like it! Imagine yourself stranded on a hostile planet, your only form of transportation now shooting across the sky in multiple fiery pieces, dissolving into the atmosphere and leaving you to explore the unknown with what may very well be the last of your kind. Despite being cliche, this setup has been a staple of the science fiction community since it has existed. The lone adventurer or group of companions battling the evil alien menace, although in this case you may just be as alien as the planet around you. 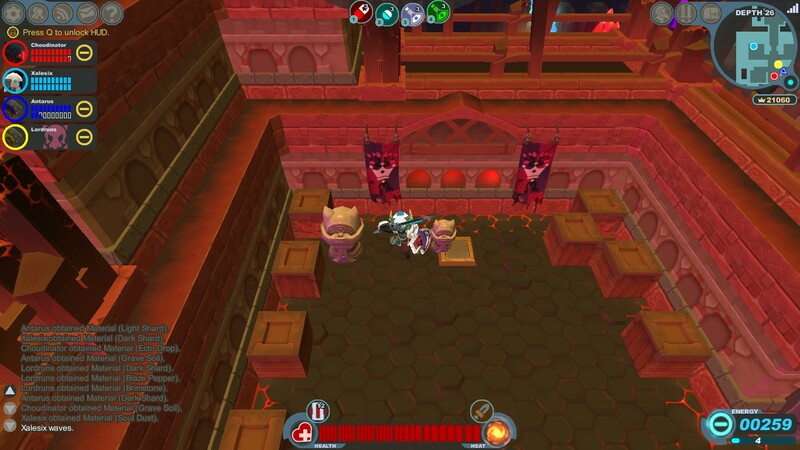 Welcome to the world of Spiral Knights, a free-to-play MMORPG mixed with a dungeon crawler, developed by Three Rings. For those of you who don’t know, Three Rings is a company that was recently purchased by Sega, and that’s about all we know about them besides the fact that they made Spiral Knights. Spiral Knights starts the player off right outside a crashed pod, almost reminiscent of the orbital drops from Halo for lack of a better comparison. This begins the tutorial, in which the player is taught the basic controls, which are simple enough to understand. The player moves utilizing the WASD keys and controls almost everything else with the mouse. Before I continue to the story, however, I must include a bit more in-depth explanation of the mechanics. The currency in the game is known as crowns, which can be collected by defeating enemies, breaking boxes, or reaching the elevator located at the end of each level. There is a secondary form of currency known as Energy, which is also required to craft new items as well as proceed further into the main dungeon of the game, otherwise known as the ‘Clockworks’. There are two forms of energy the player can use to do the aforementioned crafting or dungeon crawling. First and foremost is Mist Energy, which regenerates over time. Regardless of how high level you consider yourself to be, or how much money you have, the Mist Energy cap will always remain static at 100. There is no increasing it through items or regenerating it faster, you simply wait for that gauge to fill by a measly one energy every thirteen minutes. Secondly, there is Crystal Energy, which has no limit, but is infinitely harder to obtain. Crystal Energy can only be made by either purchasing it from other players or buying in bulk using real money at the in-game store. There is a major problem with this system, but I’ll cover that later, after I flesh out the story a little more. Let’s get to the very bare, and very brittle bones of the ‘story’. You are a Spiral Knight, part of the Spiral Order, who’s main ship has just crashed somewhere on the surface of this planet. Immediately upon finding the town, you are directed to meet with your superiors, who have found a large mechanical structure that leads deep into the planet’s core. They tell you that an elite team of knights known as the Alpha Squad were sent to investigate sometime during the apparently long duration of the flight from the ship in orbit down to the surface in your tiny escape pod. You are now to replace them and explore with your fellow knights, exploring the mechanical structure known as the Clockworks to hopefully rescue the Alpha Squad and figure out the secret of this planet. That is pretty much everything you need to know, with a lot of unexplained bits that ought not be unexplained, but who am I to criticize the developers who created such a fun game. It may not make you feel like you’re in the world, but you can smash faces and cut down hordes of enemies so I suppose it caters to a specific subgroup of gamer.